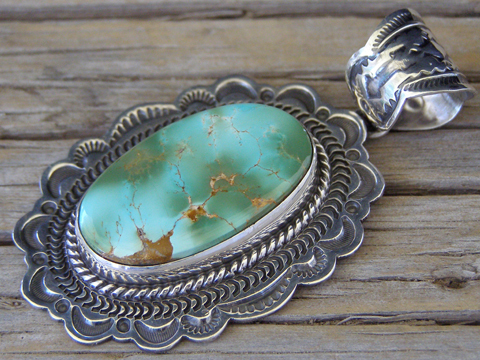 This pendant is set with a splendid two-tone blue and green stone of natural, untreated Royston turquoise from Nevada. The bezel is wrapped with twist wire and the border sculpted and decorated with stampwork. The bale has a scalloped edge and also decorated with stampwork. Stone: 1 3/16" x 11/16"
Dimensions of pendant (excluding bale & jump ring): 1 7/8" x 1 3/8"